solitaire engagement rings and engagment ring solitiare mountings. We work with several solitaire engagement ring mount manufacturers as well as manufacturing our own solitaire engagement rings, so if there is a style of solitaire engagement ring mounting you have seen anywhere, chances are we either have it, can get it or can custom make it for you cheaper. If you have found your perfect diamond on our loose diamond database or on our loose diamond specials page, you may wish to have it set in one of these fine solitaire engagement ring settings. This can be done by clicking the "set my diamond" option on the details page of the setting you wish to purchase. 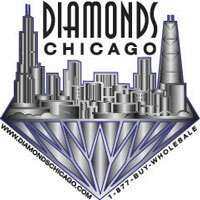 Call 1-312-422-0400 if you have any questions or ar having trouble placing your order. Classic Tiffany style solitaire engagement ring with 6 prongs.� Comes in 14k white gold, 14k yellow gold and platinum.� For all shapes and sizes. This solitaire engagement ring comes in 4-prong or 6-prong.� It comes in 14k white gold, 14k yellow gold or platinum.� It is for any size or shape diamond.